Care to fly the Zombie Flag of California from your car window? No? Maybe you’d rather wear a beer hat controlled using a dismembered arm? Or perhaps endure a radio alarm clock that groans you awake? Deep Silver have come up with a whole page-worth of tat like this for Dead Island 2’s collector’s edition. Which particular tat ends up in the box is up to you. Mercifully, there’s no Zombie Bait option. The publishers have put together a short survey, filled with ideas from the dark recesses of their brains, ready to be moulded into plastic and shoved into boxes. Voting will end on Monday, July 14 at midnight. This isn’t a new thing, apparently: collector’s editions for Saints Row IV and Dead Island Riptide in the US were filled with bits of the dead and 12-inch replica dubstep guns at the request of their respective fans. 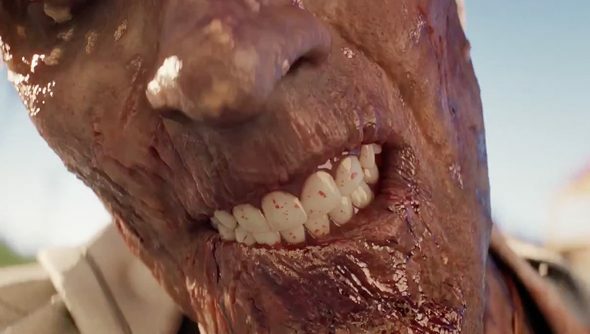 This game’s going to be an interesting one: designed by serious Spec Ops: The Line types Yager, it nevertheless looked to have its tongue visible through a hole in its cheek in the first Dead Island 2 trailer. Dead Island 2 will be out early next year. Do you think you’ll buy it in a big box, in a sale on Steam, or not at all?